So I have been asked a few times now from different people wondering why the CataBlog Shortcode won't filter categories. Strangely enough the solution is very simple and kind of comical. Many people who use my plugin come to the blog to learn more about using it. When they see an example of how to filter by category, they might copy and paste that example into a page or post's visual editor. This works fine in most scenarios, but in this specific case, the pasted Shortcode is entangled within a bunch of &lt;code /&gt; tags. These HTML tags mess up how WordPress configures the Shortcode and stops your category setting from being used. Simply remove the extra html tags or type in the CataBlog Shortcode manually to avoid this problem. An example showing both the correct and incorrectly pasted Shortcodes. Thanks, I’ve been looking for something to use for a large collection of photos and this seems to be working well. Do you have plans for bulk uploads? Erin, you may use FTP and the Scan for New Originals feature in the Options > Systems tab for bulk uploads right now. An interface that lets you upload multiple photos and edit them as they are uploaded is in the Works and should be implemented within the near future, about 3 or 4 more releases. I had this issue after updating, and found that the categories were not working. 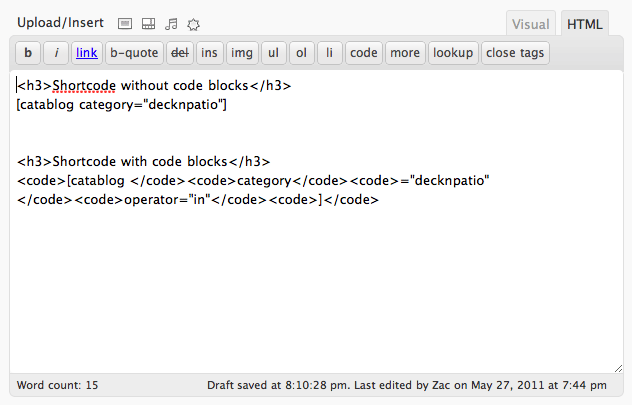 While looking at my page code, I realized that I was using [catablog tag=item] as opposed to [catablog category=item]. Problem solved!